My travels last week began in Manhattan where I visited the New School, specifically the Eugene Lang College of Liberal Arts. Full-time undergrad enrollment is about 1,300; average class size is 16. This means that inside the expanse of NYC, students still enjoy a close community. Most of the campus—dorms, classrooms, studios, and administration–is located in one very cool and upscale Greenwich Village Block. The area is full of coffee shops, delicious and affordable international restaurants , and student-friendly haunts. When they are not studying, most students have part-time jobs or internships. 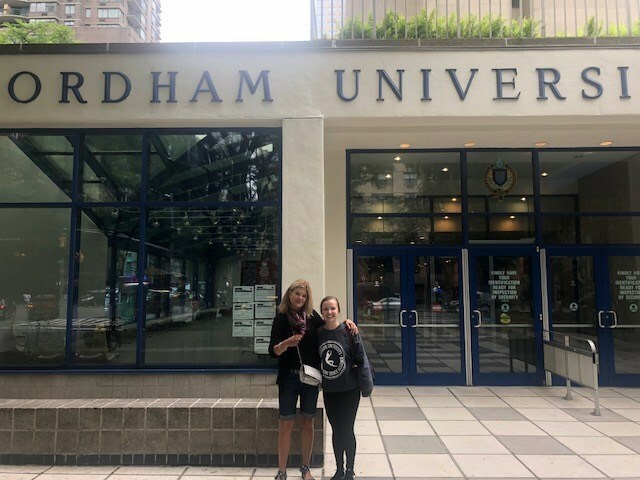 Next stop: Fordham University, another city-central college experience. The campus I visited is right next to Lincoln Center; the other—Rose Hill, is 30 minutes away by train in the Bronx; students can take classes at both locations. My tour guide, Sammy, just happened to be from Orange County, and she told me that after New York and Massachusetts, California comes in third place as the home state of enrollees. Fordham has a beautiful green space, two levels above the street. Full-time undergrad enrollment is much larger than the New School: around 8,000. Another way to have the undergrad New York City experience: Hofstra University—on Long Island, 30 minutes away by train. As you will see from the photo, LA and environs is dear to the heart of Lisa, the SOCAL college representative. Hofstra has more majors than most much larger schools, and my student tour guide told me “What is great here is that you can have broad majors like Economics or more specific majors like Business Economics.” Under grad Enrollment is 8,500. Student faculty ratio: 14 to 1. Next up: Cornell, Skidmore, Bennington, Landmark.